Accurate and repeatable control of motor power, run and DT timing plus an optional RDT override make for enjoyable frustration free flight sport flying. The E-ZEE Free Flight timer has been designed and developed so that sports flyers can enjoy all these advantages at a realistic price. 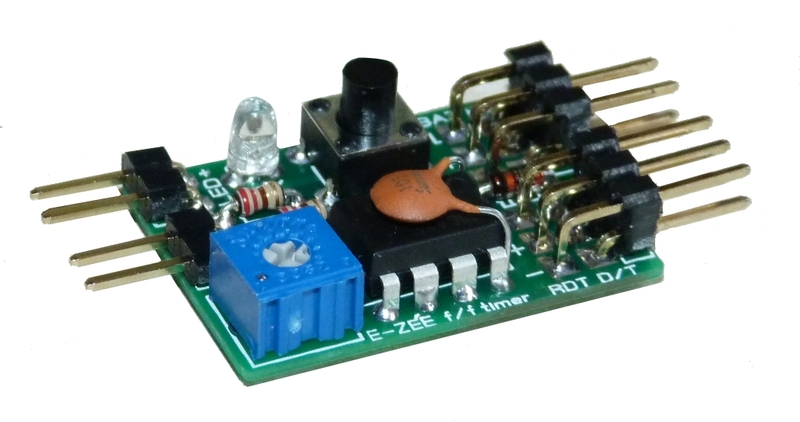 This timer controls motor power and run-time (via an ESC) and after a further delay drives a D/T servo to terminate the flight. The motor power is set by a single turn potentiometer and the motor run and D/T periods are set by a simple push button / LED interface. In addition the motor ramp up and ramp down times can be set by the user. These can be used to avoid sudden torque excursions and to ensure a smooth transition into level flight.The timer has an RDT interface which both powers the RDT receiver and processes its trip signal, allowing flights to be terminated at will. This page was printed from www.densmodelsupplies.co.uk on Tuesday 23rd April 2019 at 12:06 am.